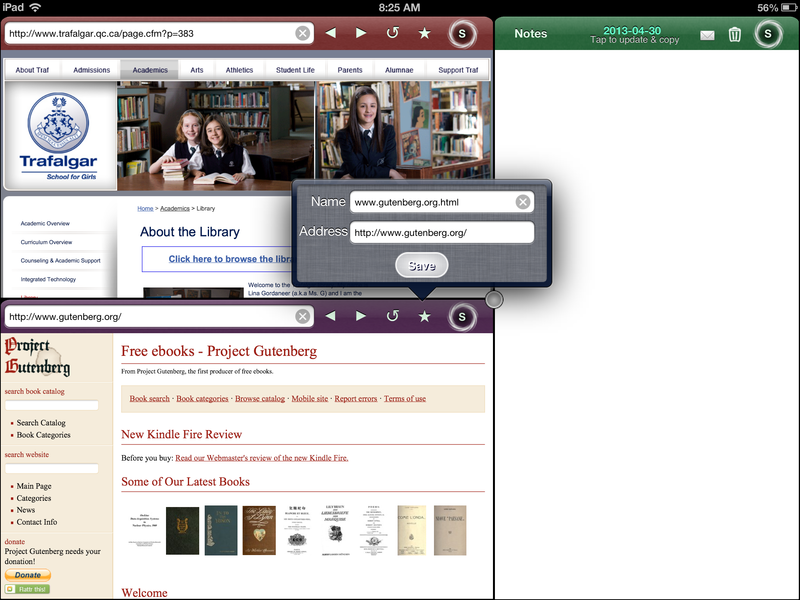 One of the more common objections to the iPad is that it does not allow several apps to be open at the same time. Although sometimes I think this might be a good thing in terms of focus, the complaint resonates with me. I am writing this on my desktop at the moment and have a total of 3 applications open at the same time: Firefox for my research, Safari for writing this blog, mail where I have emailed my screenshots from the iPad, and so on and so on. So when I posted the 24 apps to support Bloom’s taxonomy the other day, and I came across this app called Side by Side, well. You could have just coloured me intrigued. I also tried uploading a youtube video through the web option and it works fine! 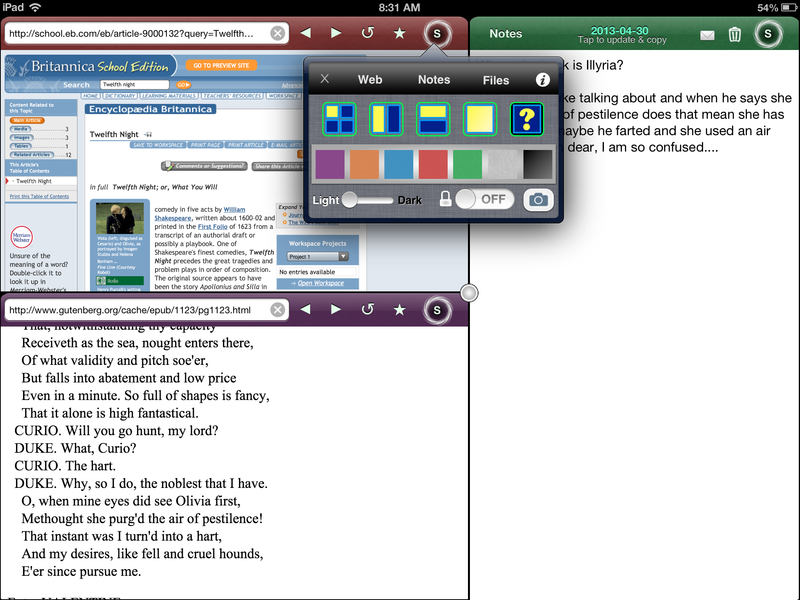 A student can watch a video and take notes without having to change screens! This is a great option for web research on the iPad- the student can have their notes right beside the text, easy and accessible. The temptation to copy and paste is neutralized by the fact that the student can download the website and have it available to them offline. 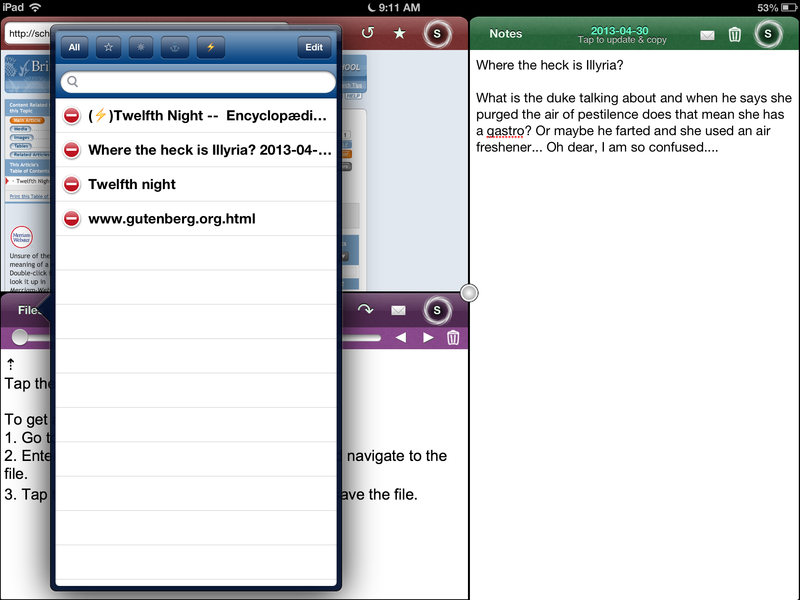 Diigo was presented at a recent conference and I am in the middle of installing it on my iPad. So far, I am intrigued with the possibility of having not only a place to bookmark websites and access them across platforms but also being able to add notes and images. A tool like this could make project work way more efficient between students. 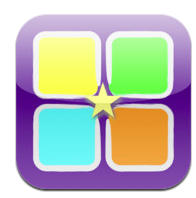 Check it out and help me explore these apps! The hardest part about adopting a new technology (at least in my humble opinion) is figuring out how it can be useful to you. Technology is a tool, after all, a means by which we reach our goals, not the goal itself. It is easy to forget this when we are bombarded with constant updates, with technology that requires even more of our already scarce time to decode. I feel like right now is a good time to remind myself (and you, my gentle readers) that the reason we are adopting the iPad in our schools is because it is useful. It is a compact, more student-hardy (it is harder for them to break the iPad than a laptop, although, yes, they still manage it), potential for an all-in-one tool. 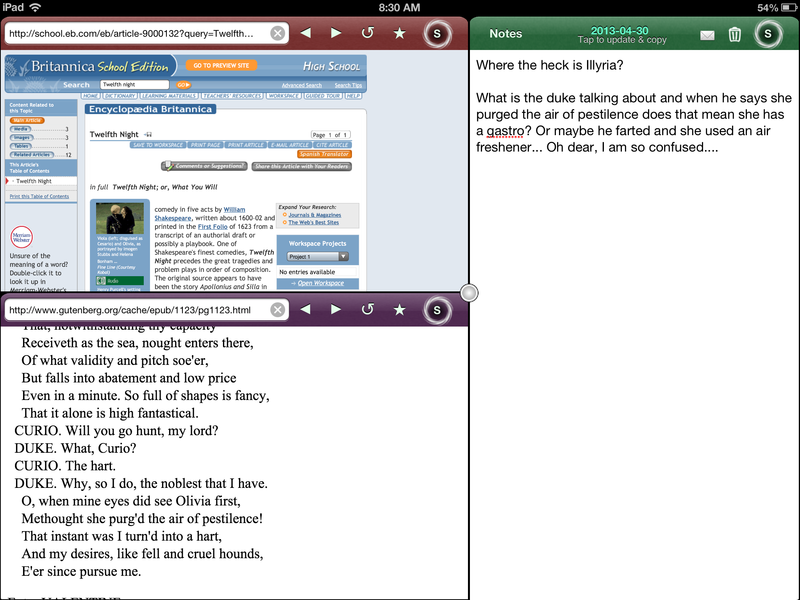 In the States, schoolboards are looking into switching from paper textbooks to e-texts. That would mean students could roam from class to class with only their iPads. They can research, read, create, game, communicate all on one device. In the same vein, it is also that handy for teachers- so far, most teachers have been using them for very practical purposes: using whiteboard app to illustrate a lesson then emailing it to their students. Recording discussion groups for the purposed of evaluation. Researching outside the library. Illustrating a volleyball strategy or even taking a picture of the notes from a meeting on a chalkboard and emailing it to the students. Not to mention the quasi personally/professional uses of managing the media we follow (I am a firm believer that the world informs how we do our jobs,especially if you are in charge of teaching children about that world. Apps like flipboard, Zite and other news feed highlighted in previous posts are an effective way for teachers to keep up to date. I was reminded of the uses this morning when I came across this fancy picture on one of the best iPads in education blogs, langwitches. 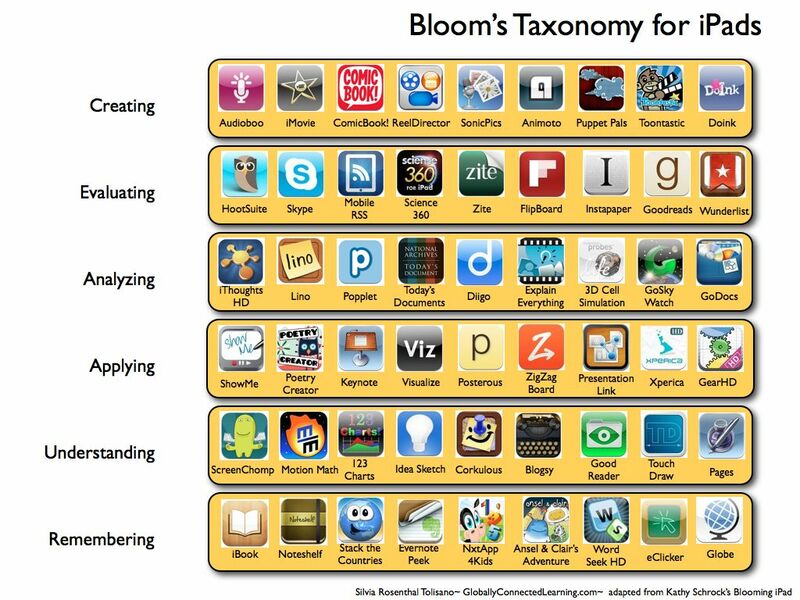 To explore more Bloom, check out Bloomin’iPad by Kathy Schrock.